Discussion in 'Civ4 - Fall from Heaven' started by seZereth, May 19, 2007. And a little bit of problem : how can I change the flame in Mardero's sword into somekind of blue? I tried changing the color in nifscope, and it worked in the preview (the flame already blue). But sadly, it still red in the game. Any advice? Very nice. Mardero's been needing a reskin for quite some time. However the helmet seems a bit odd. It is a bit, large. Why do you want to change the flame color to blue? It looks very nice in red. I can't remember Marderos lineage but isn't he only a couple relations removed from Agares, whos 'Arch-Angel', Hyborem, is also red and black? The helmet does not look right. I think you left the wings the same as in the old Mardero, but they were the worst part of that model, the only part I thought really needed changing. I don't suppose it would be possible to scale down and use Abashi's wings, would it? Mardero is the youngest and strongest of the Cambions born of Lita the Witch and the demon who captured her when the people of Alexandria threw her off the Cliffs of Hastur. That demon's name was never given, but I like to think it could have been Hastur himself, the Lord of Nightmares and Archangel of Mammon who now torments Danalin's dreams. Hastur may not exactly be the most loyal archangel though, as he seems aligned with Ceridwen in wanting to destroy creation rather than Mammon in merely wanting to control it. Condatis implied that Hastur arranged for Tebryn to destroy the world just so that she would be too busy to free her God from his influence. I think that Green (like the so called green eyed monster of envy) would fit a descendant of Mammon's servant well, but red and black work fine for demons in general. If Hyborem took after Agares color scheme then he would be black and gold instead of red. The basilica was flooded with screaming, a mob calling for the death of Lita. Long suspected of witchcraft, she was found with crow's blood on her forehead and eyelids, evidence of her attempts at clairvoyance through dark rites. The adjudicator listened to the guardsman's retelling of her capture. A neighbor claimed to have seen a cat walking backwards from her house and a pigeon handing upside down from the eaves like a bat. The guards had been called to check it out, not an uncommon occurrence for Lita. But this time she didn't open the door, and when the guardsman entered, they found her in her basement deep in a trance, with the crow's broken body beside her. "What are the names of these demons you say I follow?" Lita argued, "Hate, suspicion, fear, weakness, pride. Do you believe these are my demons or your own? You scream because I killed a bird, yet you will return to your mutton dinner tonight and see no hypocrisy. You claim that what I have done is evil, yet the temple diviners perform the same acts with oils and burnt incense." She shook with rage, her voice carried an authority far beyond her 24 years. She turned and glared at the townspeople, most she had known her entire life, and each one quieted under her gaze, but then picked the screaming back up when her eyes were off of them. The adjudicator was Goroff Grist and he had served in this role for nearly 30 years. He wasn't concerned with Lita's pagan ritual but he was very concerned with the effect she had on the city. This kind of disharmony could not be tolerated in a cultured society; she had been warned before about her questionable behavior and refused to become a good citizen. He had known the outcome of this trial the second she was dragged into the basilica. Goroff opened the large tome before him. The hall went quiet as he scribed Lita's name and the verdict. Everyone strained to gain some clue from the stroke of his quill as to the final decision. Goroff sprinkled find sand on the ink and blew on it, then he closed the tome. "The testimony has been heard and a just decision has been made. Lita of Alexandria will be exiled from the Empire. This exile will be initiated by throwing her from the Cliffs of Hastur. We will see if she will follow the crow's fate and have her body broken, or gain the crow's gift and be saved from the rocks below." ]The crowd cheered the decision, Lita screamed and attacked the guardsmen that held her. They wrestled her into submission and began the march to the edge of the cliffs. By the time they reached them, the crowd had grown and hundreds of townspeople were there to witness her death. It was an early spring day and the mists common to cliffs still hung around its base. Lita had stopped struggling and stood unmoving at the cliffs edge. She told herself that she would die without weakness and step over the edge on her own, but she found herself unable to do so. She sensed something much worse than death over the cliff's edge. Then the guardsman pushed her. She fell. Her life passed before her, pain inflicted by her and on her, actions performed both good and evil. She considered her own regret, had she become something she didn't intend? She pushed the thoughts from her mind, she was not the one at fault, but the people of Alexandria. She fed off of her own hate, wished only that they would suffer for what they had done to her. She passed into the mists and heard the snap of thick leather, like the crack of a whip all around her. A dark form slammed into her and at first she though it was the ground, but her direction changed and she felt herself being carried along the cliff's edge. A beast held her, and she struggled to see its face. It had thick hide wings and skin that felt like a serpents, but hard and warm. The face was a man's, horrible and beautiful, horns and smaller bones pierced his skin and thick iron pins were inserted into the inside curve of his eye, just where tears are formed. He took her to a dark place, Hell or some hidden cave, it was the same to Lita. She became his unwilling concubine, mother of his half-demonic children. His spells kept the many pregnancies from killing her, but they did nothing for the pain which was so intense that she wished for the times when she wasn't pregnant and had only to suffer the brutal rapes. And during the periods of the rapes she wished for the times she was pregnant. Mardero was the last of these children. His birth was so traumatic that even his father's considerable power couldn't keep Lita alive through it. His first act in this world was to join his siblings in consuming his mothers flesh, the first of many human victims his father would bring them as they grew. Now Mardero roams the land, unbound by the Compact because of his human heritage but as destructive and loyal to the forces of Entropy as any demon. Have an art question.... Will just summarize, but basically I've added an effect to a feature, and have it displaying in nifskope, but not in game. Which is fairly aggravating. Well, I don't know what is wrong with your nif. But on the misted forest, I did merge tesb's mist into forests and ancient forests. The result is can be seen in game (but static, non moving) mist. Mine is animated, so I'd prefer it. Tesb's is also animated, but somehow when I merged it with the forest, the mist become static. Tesb's is animated the same way as mine. Both come from Haunted Lands. 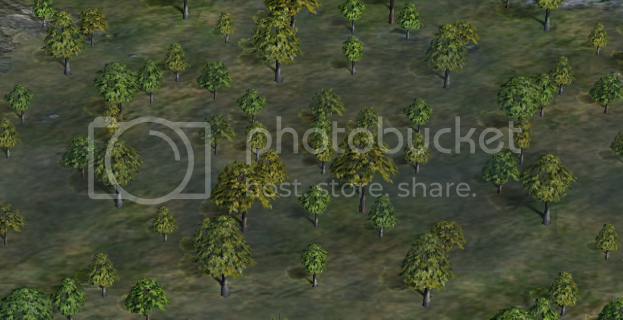 I actually got it displaying in game, and had the same problem you did; Animated by itself, static with the forest. Easy to fix, though... Simply make the mist node a child of the forest node, rather than the other way around. As soon as I made that switch, the mist began to move. Ran into a problem with forests. The tiling basically causes mist to spread out onto multiple tiles and lose it's animation; In the end, I removed the tiling effect from the feature, using the last nif (which covers the plot) for the feature. esvath everytime I look into this thread it´s a pleasure to see your work. Some months ago I opened a thread in the modmod subforum discussing ideas about more divers arkebuse unitstyles. But unfortunately noone of us had the needed programs and skill to bring these ideas into a real model. A new Bannor arkebuse unit would be awesome. Armored in the same style as the champion, maybe a bit less armored ( without shoulderplates for instance ). This would be the style used in the warhammer mark of chaos intro. In my opinion it would fit to the Bannor army very well. I have good news and bad news, esvath. 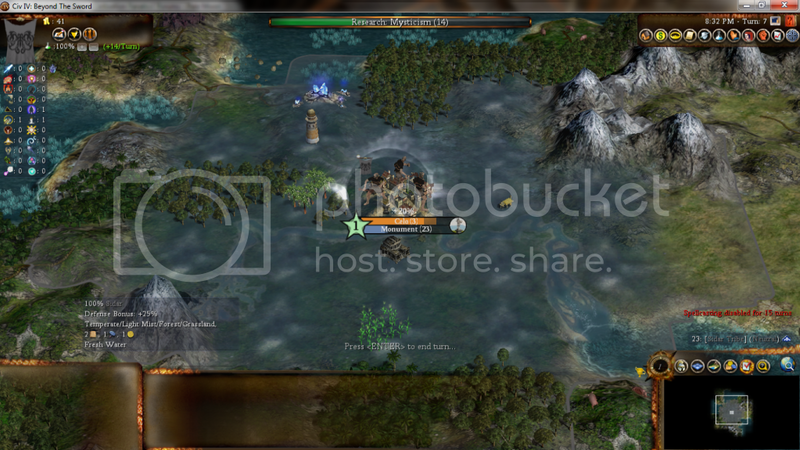 The good news (for RifE players): Grey Fox got mist working with forests, resources, etc. Where before it would cover resources, and couldn't be feasibly added to the forest nifs (at least, not by myself ), now it cooexists nicely with both. Just check the picture. The bad news? It's done in the DLL. Basically, we just change the plot's FeatureArtDef... It seems like it should clear the forest, but the art doesn't update completely. Even if you save/reload. We're perfectly okay with it. Hey guys - just to say, keep up the good work - always checking here to see what the latest graphic additions are. Just wanted to offer my own meagre work: a reskinned version of the Svartalfar Druid. I use it for a custom hero but if it is of any interest to anyone, feel free to download it. I want to thank you for your massive effort and hope the flood of nice civ4 compatible art won't run dry .. I always looking for appropriate skins and models for my Song of Ice and Fire Modmod and guys like you are so rare! Hey, did this thread pick up elsewhere? It seem to have abruptly stopped. My friends and I are getting into FFH again, and we want to know if there was a pack that had some finished models for the placeholder units. I don't know ... but Master of Mana (website in Sephi's sig), has TONS of textures and art. Maybe some of those will be useful? Yes, my friends and I have been doing multiplayer lately, except we're using a new Tweakmod I'm building. When it's done, I'll release it on here. One of the things I want to do, if possible, is update some of the placeholder units. I was thinking of recoloring Epona from Age of Ice to be the new Mobius Witch, for instance. If you have a link to where I can download models, that'd be great. Hello there. Id like to remake some models on mechanos civ, and wanted some advice. i couldnt find where its files are, until i guessed mechanos use some models from BTS... its true? Is this post still alive? The files you are looking for might be in Rife/Orbis .fpk. Try to unpack the .fpk.